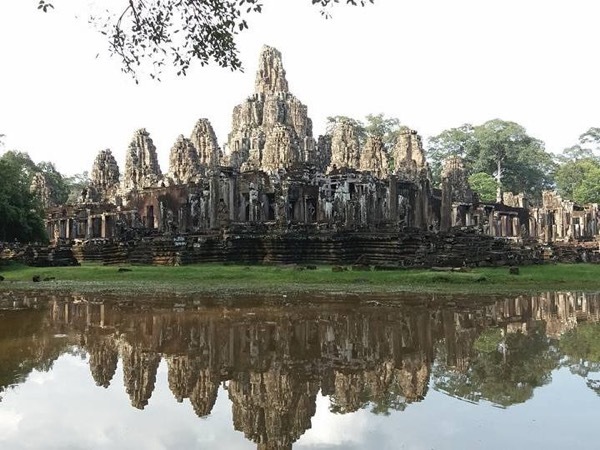 Traveler Reviews for Private Tour in Siem Reap, Cambodia by Tour Guide Dara R.
We want to thank Dara for giving us an unforgettable 3 days at Angkor Wat. Dara's in depth knowledge of the history and culture of the time was excellent. We were overwhelmed with the beauty and workmanship of the temples. It was a pleasure to spend our time with him. He drove us through the complex in a very comfortable car which we especially enjoyed for the air-conditioning breaks. It was very hot and he kept a cooler of cold water for us. It was an amazing visit that we will always cherish. Dara put us at ease and gave us the best experience that anyone could have asked for. He took us back in time with his stories. Extremely knowledgeable, had a way of presenting history in an interesting way, bringing the past alive and making it absolutely special. His fluent English, witty sense of humour, and caring nature made our holiday a one to cherish for life!He was highly respectful, safety conscious, and prioritized the comfort of the elderly! A good photographer. I'd highly recommend him." I would highly recommend Dara as a tour guide in Siem Reap. He is excellent at describing the sites and navigating so you get the best photos. He let us set the pace and was very accommodating with the schedule. He always had the driver waiting to take us to the next place and had plenty of bottles of cold water. Our visit to Angkor Wat was the highlight of our vacation and Dara played a large role in making this a very memorable experience. I had a fantastic 3 days in Dara's company. His knowledge of everything to do with the temples down to where to get the best photo was comprehensive. It was a joy to hear Dara's passion for his country, its history and its present day. The daily timings and itinerary was flexible to my wishes, which was very helpful. I felt like I had started with a guide but after 3 days had made a friend. Dara was very friendly and accommodated our wishes over the 3 days that we were with him. He has a vast knowledge of the historic sites and the history surrounding each location. He took us to the best areas at each of the sites so we could appreciate the full beauty without the interference of the massive crowds. This was a standard tour offered in Siem Reap and if you are in the area for 3 to 4 days we would definitely recommend Dara as your guide. An excellent tour. Dara's English & knowledge is good. He always got us into good positions to take photos. He is easy to get on with & is good fun. Dara was a perfect guide---always on time and very knowledgeable about his beautiful home town. We really enjoyed his tour. Angkor Wat is very special!!! WOW!!! AMAZING!! Dara was the most fantastic guide. He is friendly, knowledgable & helpful! He is good at showing you all the best spots for photo's & the best times to see the sites. We saw everything we wanted to, as well as being given interesting information. Dara's English is very good & he explains things very well. Without Dara we would not have seen Siem Reap the way we did & we would have missed a lot of things. THANK YOU to Dara for the most amazing time ever! I HIGHLY recommend him!! Dara gave us a brilliant 3 day tour. Very knowledgeable and informative. Although it was booked as a set itinary Dara informed us each day of the schedule and asked if we wanted to change anything. Both Dara and his driver were accommodating and highly recommended. The tour was well organized and completely safe. The guide has been very nice and kind. This tour is recommended for those who prefer confortable tour arrangement for the visits, instead of self-organizing them with the tuk-tuk. TOUR GUIDE RESPONSE: Thanks of your visit my country and let us be the part to serve you. We wishes you happiness and more success in work and life. Hope to see you all again soon. from Dara. Dara was very knowledgeable friendly humerous and professional. We ranged in age from 17 to 66 and he kept us all interested. He knew all the great spots to get good shots of the temples. I would definetly recommend him to friends going to Siem Reap and I rarely make recommendations. TOUR GUIDE RESPONSE: Thanks you both of your visit to my country and let me having the chance to introduce my country to you . See you next time soon. Dara. We had a wonderful time with Dara on this 3-day tour. Dara is friendly, knowledgeable, and very passionate about his country. He was also more than willing to be flexible with the tour to meet our needs and interests, which was perfect for us. Highly recommended! TOUR GUIDE RESPONSE: Thanks to you both again of spending your valuable time visiting my country. From Dara ! TOUR GUIDE RESPONSE: It was our pleasure of serving you. Thanks to you all of spending your valuable time visiting my country. We wishes, you good luck, prosperity and our are looking forward of serving you again soon.From Dara. Dara kindly agreed to accept our booking when he was already busy. He arranged with a colleague to complete the visits with us as he could not provide the three days tour himself. Dara was very knowledgeable and tried to show us everything himself in two days, yet we enjoyed having the extra time with his colleague Kim to go back to visit one or two of the temples with a little more time. I would highly recommend the Tours by Locals and have used them successfully in a few different continents. Mr Dara is very helpful, polite and very kind. He is also very proud of his county and will try his best to answer our questions.